According to Angie’s List1, Americans spend an average of $9,600 for bathroom makeovers. However, with careful planning, you can save thousands of dollars on a brand-new bathroom. Here are easy ways to cut costs and save money on your remodel. A good-to-know fact: Consumer Reports2 writes that every Home Depot employee is authorized to give a discount of up to $50. But they’ll only give you this secret discount if there’s a good reason. If the sink fixture you’re eying on display is the last of its kind in stock, for instance, ask the clerk to mark it down. Paint the walls a fresh new color. Get a new shower curtain and matching rug. Change out the towels and window coverings. You’d be surprised how many affordable vanity accessories you can find at retailers. Shop at dollar stores for jars, drawer organizers, and candles. If you have bare wall space, hang industrial-chic shelves. Unlike bulky standing or wall cabinets, open shelving in a small bathroom creates the illusion of space. Use wire baskets to store pretty soaps, lotions, or linens. Wicker baskets with lids are ideal for personal items. A small potted plant adds a homey touch. These small tweaks go a long way to update your bathroom, both in style and value. Along the same lines, save on granite or other countertop materials by asking to see remnants first. 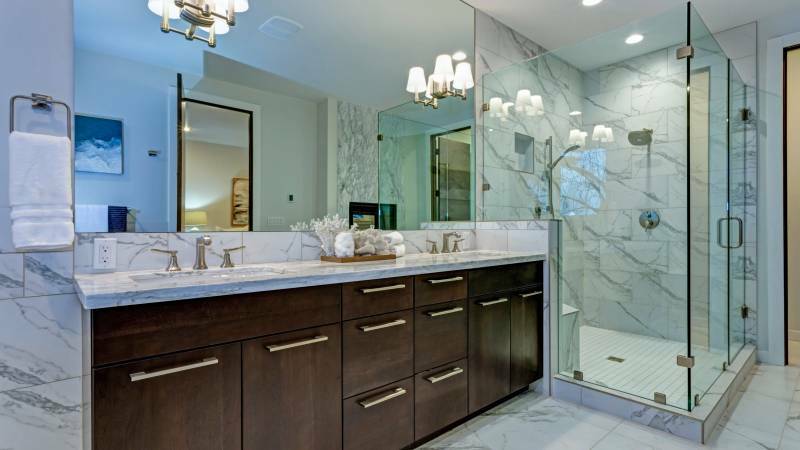 If your vanity isn’t too long, the granite company will probably have discounted remnants that are just the right size. Finally, if you’re making significant changes, hire an affordable local contractor. It may seem easy enough to watch a video tutorial and retile your shower, but you don’t need the stress – or the potential mistakes. Do-it-yourself projects don’t save money if they have to be torn out and redone. An experienced professional can help you plan, stick to your budget and avoid costly errors. Contractors also have access to resources you may not think of. They can locate far cheaper parts and address any unforeseen electrical or plumbing problems that may arise. Hiring a contractor will save you countless headaches no matter the size or scope of your remodel. And you can easily find one in your area. Interested in hiring a low-cost contractor for your bathroom remodel? Looking for other helpful info? Start a search today.